The early drama for the first go at the Canadian traveling football championship was between the Ottawa RedBlacks and Calgary Stampeders. But the best team proved to be the Saskatchewan Roughriders. Of all the North American sports, the Canadian Football League (CFL) is the circuit most likely to put up with tie games (though a nag here and there thinks tie games in baseball would be a good idea now). 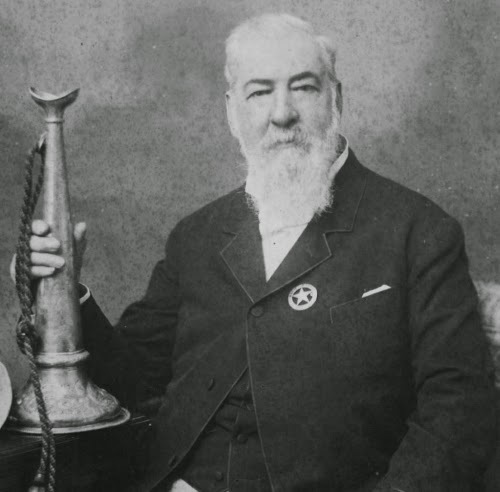 Anyway, then, it's probably not for the worst that the first game ever for the Canadian traveling football championship would end in a tie, which it did. Nor must we despair that the title would change hands in a rematch between the same two teams the next week. Thus it went, though, with the Canadian game in 2017. The 2016 Grey Cup game, a 39-33 overtime win for the Ottawa RedBlacks over the Calgary Stampeders in Toronto, was so good that the CFL ordered up back-to-back rematches to begin the 2017 campaign. 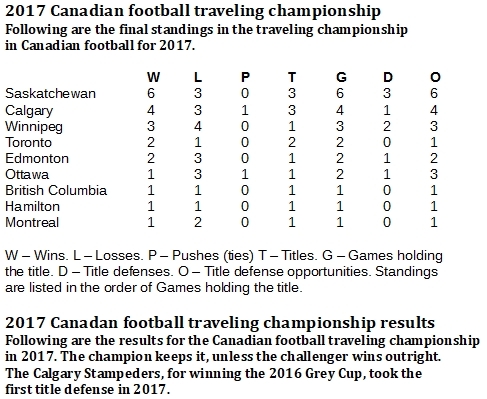 Further heightening the drama, of course, was that the Canadian traveling football championship would be instituted beginning with the 2017 season. As is the custom, the previous season's league champion becomes the initial title defender, and that team was Ottawa. So, the teams first met on June 23 in Ottawa, they played four quarters and an overtime and still ended in a 31-31 tie. As this was the first game of the championship and not the league championship game, no further attempt was made to break the tie. That would happen on June 29 in Calgary, where the Stampeders registered a thrilling 43-39 victory. 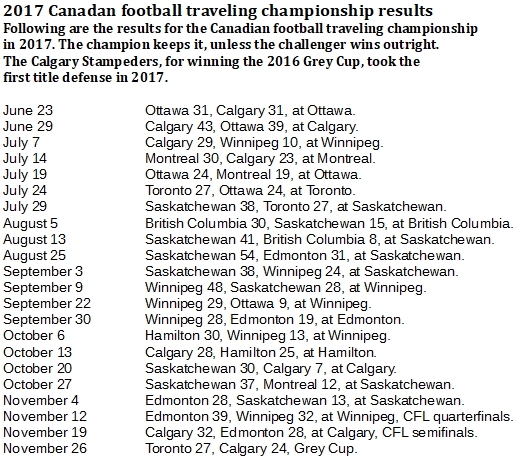 Claiming the first Canadian traveling championship won on the field, the Stampeders also won the title two more times. But they were not good at defending it, succeeding on only one of four tries. The last of those failures was a 27-24 loss to the Toronto Argonauts in the Grey Cup, played in Ottawa. The most successful effort for this first season of traveling title pursuit went to the Saskatchewan Roughriders, who won three championships and made three successful defenses in six attempts. Thus, the Roughriders go into the books as the first Team of the Year in Canadian football, another stellar distinction for this community-owned force from Regina, which also has won 28 CFL Western Divisions and four Grey Cups.